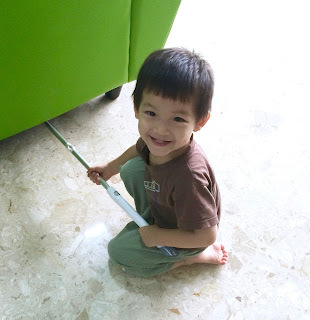 As he observed his older siblings using the magic clean wipers to sweep the floor, Joram felt very left out and cried to be allowed to do it too. Thus, I shortened the stick of one of the wipers and let him give it a shot. Needless to say, he was delirious with glee but his level of competence left much to be desired... Hahaha... Hopefully, he'll do better with practice and maturity.